Wonder Woman gets a new costume. We're unsure about the jacket. I have a confession to make: I’m a shameless geek for new superhero outfits. At least once per decade, every iconic comic book hero will get a new look, usually to signal a massive storyline shakeup, a new creative team, and/or a desperate bid for cultural relevance. Witness electro-Superman, Invisible Woman post-stripperobics, and The Scarlet Spider (a.k.a., Spider-Man for the Torn Hoodie crowd.) The new outfits never last long, but they do provide an intriguing, time capsule-ready look at the fashion (and the silliness) of their cultural moment. 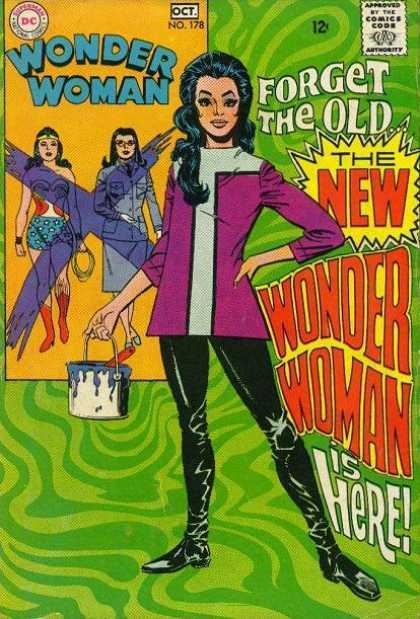 So no matter what you think about the new Wonder Woman outfit, we can all agree that this costume change proves definitively that 2010 is cooler than 1968. The first thing you notice is that our favorite Amazon princess has roughly quadrupled the amount of clothing on her body. That’s an admirable impulse: when people talk about unrealistic depictions of women in comics, Wonder Woman is public enemy number one. Still, I wish they had come up with something slightly more colorful: between the long black leggings and the dark blue jacket, this new outfit sort of looks like Joan Jett with a jewelry budget. But then again, I still think Daredevil should have kept his yellow costume. What do you think, PopWatchers? Vote in our poll after the jump! Spider-Man joins the Fantastic Four, gets new white costume: Shameless marketing ploy or shameless marketing ploy that we might actually enjoy? Comic book fans: What are they saying about the slew of new superhero films?